Thank you to all of you who played along this week. Once again you made it hard for the design team to make their choices. It was wonderful to see such an amazing assortment of patterned paper and wonderful range of designs in our gallery this week. 1. Joanne's Choice: Chrissie's elephant is pretty in pink and the perfect way to welcome a baby girl! 2. Claire's Choice: Amy's plaid showcases her gorgeous cup of cheer! Bravo! 3. Jan's Choice: Su's softly stencilled background, frayed twine and cute bunny won me over. Congrats! 4. Sandy: Tristan's quirky little bird made me smile, and I love the diagonally stamped sentiment! 5. Elizabeth's Choice: Maja's card is sooo clean! Love the beautiful roses and subtle leaves. Congrats! 6. Ann's Choice: Heather's card will brighten anyone's day! Perfect paper, perfect bling! Congrats! 7. LeAnne's Choice: Stef's cute little fall scene is as cute as can be..and colored beautifully! 8. Anne Marie's Choice: Mindy's little mummy kitty is adorable. I just love that plaid background too! 9. Laurie:Lisa's Halloween card caught my eye. Adorable image and SO fun. Congrats! I love Angie's take on the sketch. The placement of the globe was perfect for the sketch. Those stitched borders were the perfect way to separate the elements. 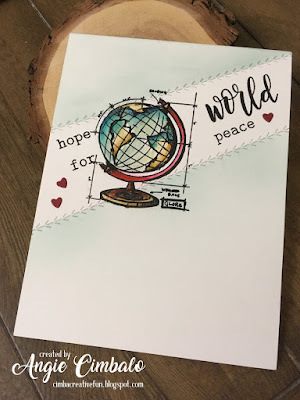 The touches of red with the hearts on the left and the right tied in perfectly to the red on the globe. Gorgeous card. Congratulations, Angie, on being my HEADLINER this week. Thank you again to everyone for playing along with us. Congratulations to all our winners, please pick up your badges here. Come back tomorrow for a fun Tic-Tac-Toe Challenge from LeAnne! So thrilled to be a part of that gorgeous gallery of inspirational cards! Thanks so much! Wow, so honored! Thanks for choosing my card, I love all the creations - congrats to all and thanks for inspiring us with your themes, sketches and awesome DT creations!!! Thank you so much for choosing me as one of the top picks ... What an honour! And thank you for having such funny and inspiring challenges. Thanks for making my card your pick LeAnne! You've totally made my day! And congrats to Angie for being this week's Headliner! Congrats Angie! Thank you Anne Marie for picking my card! I am so flattered. I just love playing with your challenges. You are all amazing! Thank you so much Laurie, I am glad you enjoyed my card! Congrats to Angie for Headliner and to everyone picked!